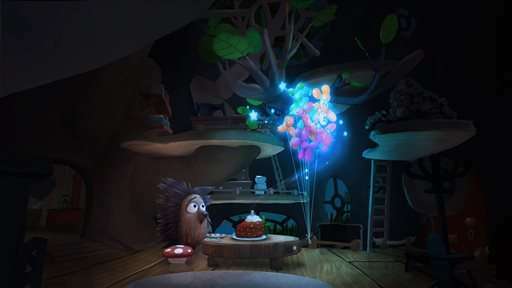 Oculus is hedging its bets that an adorable critter named Henry can help convince consumers—and Hollywood—about the viability of virtual reality as a storytelling medium. Inside, guests donned consumer versions of the Oculus Rift headset and were offered a 360-degree glimpse into Henry's cartoony home as his birthday wish magically came to life. "Henry" is the second film from Oculus Story Studio, an internal production company that Oculus established last year after Facebook bought the VR company. "Lost," the studio's first short film, debuted at the Sundance Film Festival earlier this year. "The goal with 'Henry' and these short films isn't to be an introduction to virtual reality," said Oculus founder Palmer Luckey. "We're trying to build things with Oculus Story Studio that other people can learn from and build better content from as a result." Luckey added that Oculus isn't attempting to create a studio to rival Hollywood's existing players. Instead, with "Henry" and Oculus' other work, the company is seeking to demonstrate VR's capability and inspire studios and production companies to create content beyond promotional efforts connected to other films and entertainment franchises. "In a perfect word, we'll have all the major studios making tons of VR content because they're making tons of money off of it," said Luckey. "That would be much better for us than having to hold up the entire VR marketplace with our own content. Nintendo managed to do that with their games, but it's really rough. It'll be much healthier to have a diverse ecosystem." "Henry" is an entirely passive experience that doesn't require viewers to use a controller, other than tilting their head to see the action inside Henry's tree-trunk abode. However, "Henry" director Ramiro Lopes Dau, a former animator at Pixar, included the ability for the spikey character to look directly at the user during the experience. "I think there's room for all difference kinds of experiences, where they can be more or less interactive," said Lopes Dau. "In the case of 'Henry,' it's more about the character. We use those moments when he's happy or sad to look at you no matter where you're standing." "I don't think anyone really knows," said Lopes Dau. "Personally, I don't care what it's called. I just want to make something that gives you an emotion, tells you a story and is magical to you. I don't care if it's called a game, a movie or something else." The former start-up, which ignited the latest VR obsession three years ago, now has several competitors similarly diving headfirst into the marketplace, including Valve and HTC's Vive headset and Sony's Project Morpheus, which works in tandem with the PlayStation 4 console.